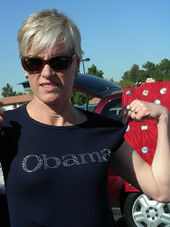 Cecile Richards is the daughter of Democrat Gov. Ann Richards, the last Democrat to lead Texas (1991-1995). Richards is the wife of Kirk Adams, a fellow union organizer. She was a teenager when she worked on her first election campaign, supporting Sarah Weddington in her race for the State House. Weddington is the Austin attorney who had successfully argued the Roe v. Wade abortion case before the U.S. Supreme Court. In 2003 Richards founded progressive organization, America Votes. Its website claims that it is the largest grassroots voter mobilization effort in the country, with 260 state-based partner organizations. The group lobbies for the environment, civil and human rights, abortion rights, education and labor. In 2009 Richards was listed on the Board of Directors for the Texas Freedom Network. 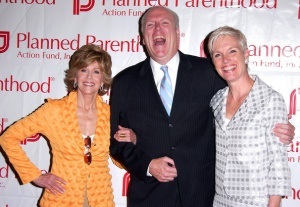 Guest speaker and actress Jane Fonda, Congressman Joseph Crowley and President of Planned Parenthood Federation of America and Planned Parenthood Action Fund Cecile Richards attended Planned Parenthood Action Fund and Planned Parenthood Advocates of New York City for the One Million Strong Cocktail Party, a fundraiser to help make this a pro-choice election year. The event was held at The Prince George Ballroom on June 2, 2008 in New York City. The Gala Host Committee, for the December 10, 2014 Midwest Academy Awards Ceremony included Cecile Richards — President, Planned Parenthood Federation of America . Congresswoman Pramila Jayapal January 30 2018. I'm thrilled to be speaking tonight at the State of OUR Union with all-stars like Congresswoman Barbara Lee, Rep. Judy Chu, Tarana Burke of the #MeToo movement, Cecile Richards, Kristin Rowe-Finkbeiner of MomsRising.org, Alicia Garza and Ai-jen Poo. #SOTU. This page was last modified on 20 August 2018, at 14:35.